The primary missing element of the message board is the logo of our school. As you can see I have added it to the header of the page. And there are some missing information. I think by adding the logo, visitor of the board will be more convinced to participate on any ongoing discussions. I would very much appreciate if someone can send me sample picture of MNHS logo..
Any picture will do as long as I can clearly see the missing parts. so this is the logo? 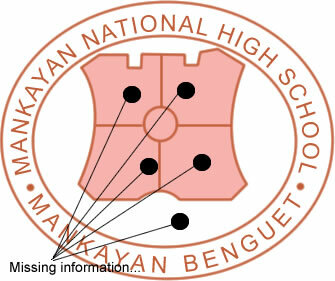 (but there are missing parts)i didn't even know there is a logo of our school.poor me. sige we'll try to look for it, we can ask help from people from our friendster account. hmm.. are there any updates on where to get a logo..?.. ..and why on earth no one seems to know 'bout it..? i can't help but wonder.., does the logo really exist..
hmm.. my P.E. t-shirt has MNHS logo on it.. I think..
really..? hmm..we didn't have such shirt b4, i guess..
uhh..i remember pla n parang may logo dun sa sch. organ ntin..(meron nga ba??) d kya un din un..
thank you for the assistance ma'am. looking closely, the ff. logos/seal are all the same..
sorry for the inconvenience, there were no high resolutions available..hope this will help..thanks..